Project Director Bob Crowder has never seen a community more excited about a construction project than Whiteland is about the medical facilities Keystone Construction is building for Johnson Memorial. “I’ve read more posts about it on social media than I can count,” shared Bob. Johnson Memorial Whiteland will replace an abandoned grocery store, a depressing eye sore for the community. More importantly, building Johnson Memorial’s clinics provide the public with accessible, quality healthcare in Whiteland. As the healthcare industry further encourages patients to actively manage their health, Keystone Construction is proud to assist in providing a critical need for Hoosiers. One of the biggest challenges of the project is making sure the structure is built to keep pace with the vastly growing markets. Bob’s extensive healthcare portfolio has prepared him to produce a structure that can accommodate the owner’s needs. Our team has helped Johnson Memorial plan and budget upcoming projects, and has shared cost saving ideas. 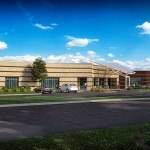 Johnson Memorial Whiteland will house three medical tenants: general practitioner, OBGYN, and a pediatrics clinic, while the Greenwood location will be primary care. 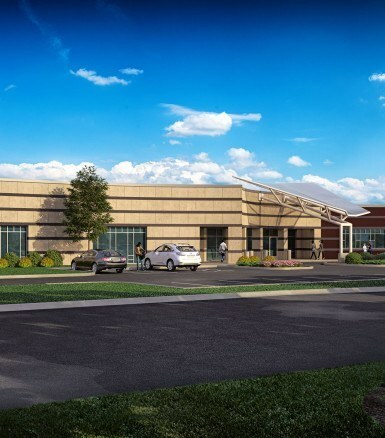 We are in the midst of the Greenwood project and just began the Whiteland project, and we look forward to the opening of these modern facilities. A rendering of the Greenwood location.